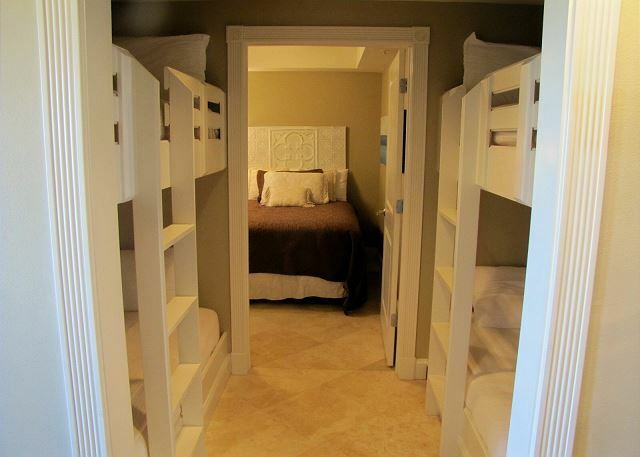 Bunks in the Hall leading to the guest room with 2 full beds. 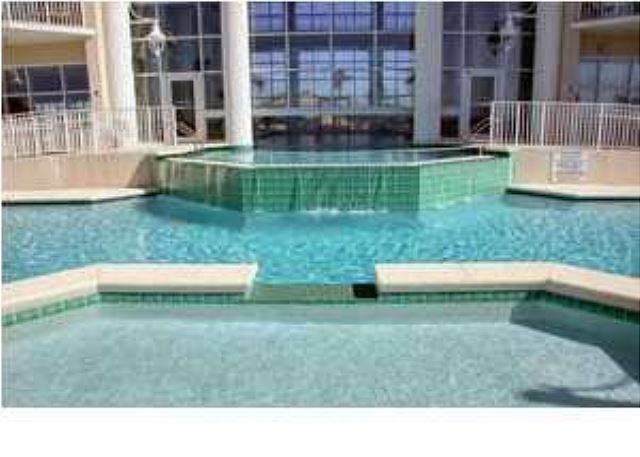 Destin Beach Condo Rental! Penthouse with Million $$$ views from 40' wide balcony! See all the way to Navarre on a clear day! Awesome sunset & moon light views too! 3 bedroom 3 bath with bunks in the hall! Great location! Top floor condo overlooking the prettiest sugar white sandy beaches in the world! Sleeps 12 with at least 4 kids on the bunks! All travertine flooring! No carpet! 32' LCD TVs in every room! 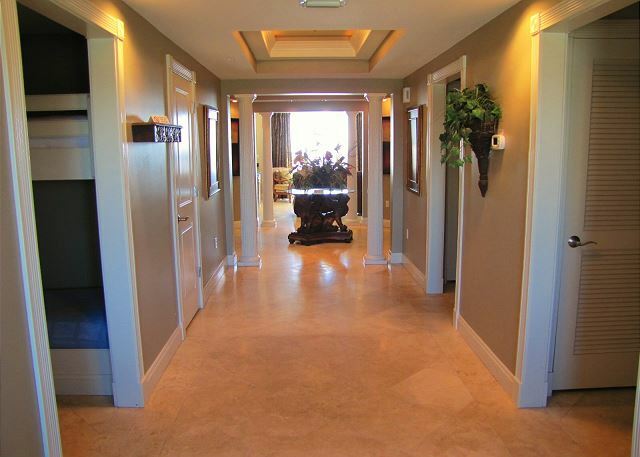 Impressive foyer, wet bar, travertine floors, granite counters, stainless steel appliances, built in speakers, and fabulous master suite! Master bedroom with incredible Gulf views! 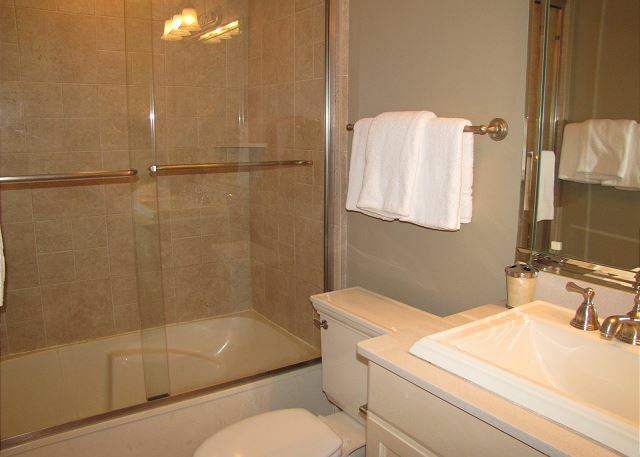 Master bath with travertine floors, jetted tub, and separate walk-in shower! The views are incredible all around. Wonderful sunset views to the west! The master has a king bed, 1 guest room with a private bath has a queen bed, and the 3rd bedroom has 2 double beds. The bunks are in the hall to the full bedroom. Walk to restaurants, close to shopping, golf, water sports, and all activities in the Destin/Miramar Beach areas! Located in the Seascape Resort on Scenic Gulf Drive. 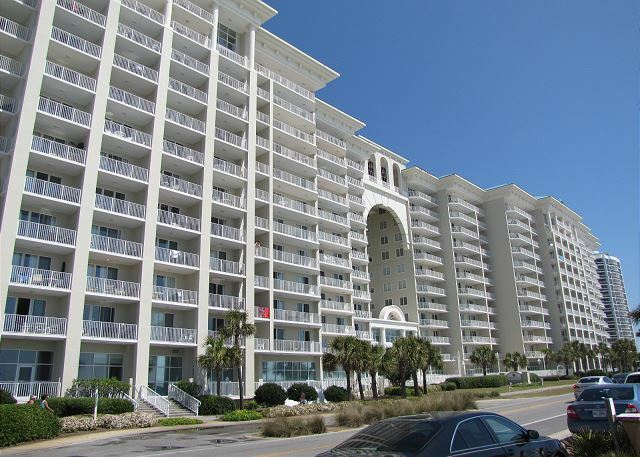 Make this luxury condo with over 2200 square feet your vacation home while you're in Destin! Contact us today for more details. Majestic Sun amenities include controlled access to the penthouse level, indoor/outdoor pool, hot tub, fitness center, and beach access just steps away! Golf is close at Seascape! Beach service is available at the beach for a fee. 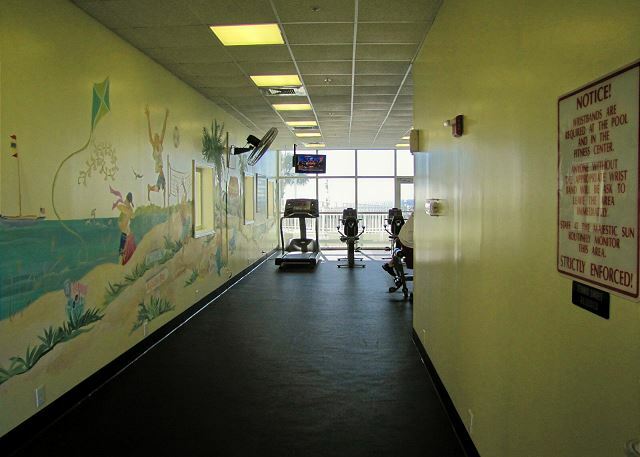 Majestic Sun is a smoke free facility. Smoking is not permitted on the balconies or inside the condo. It is only permitted in designated smoking areas. Vacationing here is an annual, sometimes two to three times a year event for many families! You should come too! When you come once, you'll want to come again and again! Some people make this area home after just one visit! Come see why! This property was excellent for our family, and provided an outstanding base for our vacation. It was spacious and conveniently located to the things we were most interested in. We plan to return again next year. Loved the location of this property and the top floor has amazing views. Hi Kelly, We're glad to hear you enjoyed your stay at Majestic Sun 1204B. I have to agree, the views are quite incredible! Hope you'll come back and stay with us again next summer. The furnishings inside the condo are due for an update but still a decent condo for the price. The view of the water is excellent! Crystal Waters was easy to work with and the property was amazing. Next time we go to the Destin area we plan to stay here again. So glad you enjoyed your stay at Majestic Sun B1204! It is super nice and has an extra wide balcony with incredible views! We had a large group of adults and this home worked out perfectly. We never felt crowded and everyone was able to relax comfortably. 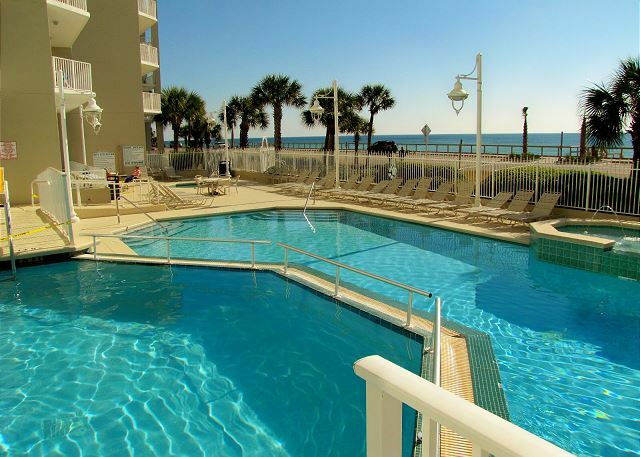 The location is great - we were able to hang out at our pool or cross the street to be on the beach. The grocery is nearby and we were just a short trip to the restaurants in Destin. The ice maker was a pleasant surprise! Now I want one at home! The home was well stocked and we had everything we needed. The only thing I I didn't know beforehand was the bunk area did not have a door so the person who slept there could hear everything going on. I felt like the checkin instructions could have been more clear. There are different codes for the condo, pool and parking garage. It would have been nice if they had been available on the app. We were very happy with the accommodations and the location and would definitely come back. Glad our Majestic Sun B1204 worked out so well for your family. The complex is convenient to everything you could want. There are codes for everything around the complex and we'll look in to adding them to the app. Working with Crystal Waters all of the staff was very friendly & helpful. 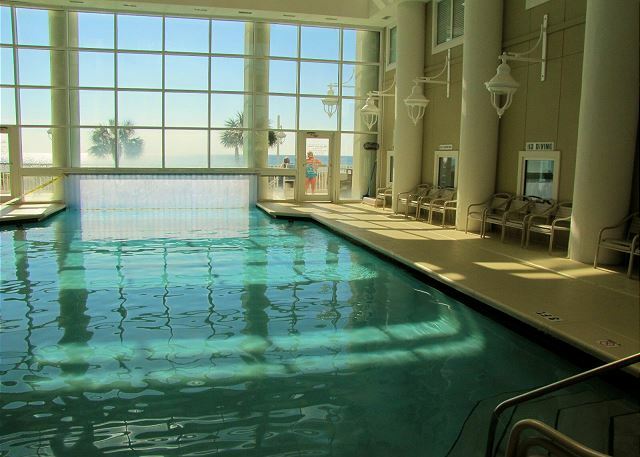 Glad you enjoyed your stay at Majestic Sun B1204! It has a 42' balcony with the most mesmerizing views! It was a very good experience, the people at crystal waters realty were so nice. When we had any questions or we needed them to show us something, they would be right there. So glad you all enjoyed your stay at Majestic Sun B1204! It is a nice condo with incredible views from its 42 foot wide balcony! We do our best to ensure the best vacation experience for everyone! we go to destin area every year and have stayed at severval places this by far was best place we have stayed. everything was the way it said it would be. So glad you enjoyed your stay at Majestic Sun B1204! It has the most mesmerizing views from the spacious 42 foot balcony! Our stay at the Majestic Sun was fabulous!! The unit looked exactly like the pictures...nice and roomy, clean, great balcony! You could literally walk to the beach in minutes. Very convenient! Tyler was super helpful in answering questions and getting us all situated. We would love to come back for another visit! So glad you enjoyed your stay at Majestic Sun B1204! It is a nice condo with mesmerizing views of the Beach and Coastline! The extended balcony is awesome and access to the beach very easy! Destin is a beautiful vacation destination. The condo was gorgeous. I would state that some of the outlets don't work...they appear to have a "loose" connection. Also, the front door was difficult to lock and unlock; probably due to wear and tear. I would also suggest more guest towels and it would have been nice to have some Tupperware available to keep leftovers in the refrigerator. So glad you enjoyed your stay at Majestic Sun B1204. 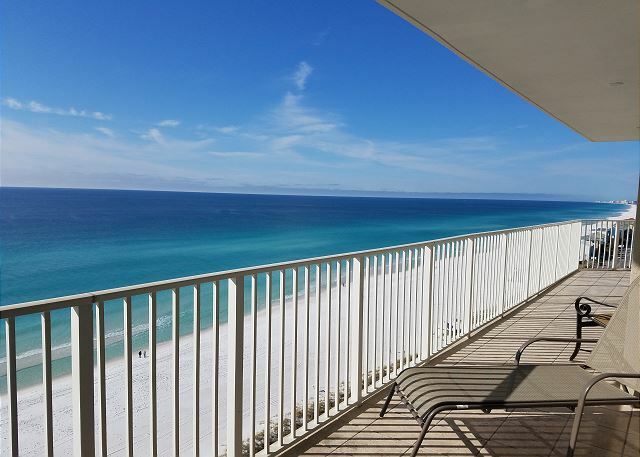 It is a nice condo with the best views in Destin! Will check the outlets and the front door lock. Tupperware is a great idea and will pass that on to the owners for approval. So glad you enjoyed your stay at Majestic Sun B1204! It is super nice and the views from the 42' balcony are mesmerizing! One of the cleanest and well maintained properties I have been in. Gorgeous view. Customer service was excellent. Will definitely be back! So glad you enjoyed your stay at our Majestic Sun B1204 Penthouse condo! It is a super special condo with incredible views! We do our best to keep it nice, clean, and comfortable for everyone! a few pieces of furniture were worn, but overall this was a great family condo that was a perfect fit for our first fall break with room for everyone! So glad you enjoyed your stay at our Majestic Sun B1204 Penthouse condo! It is a super nice condo with incredible views! Big and spacious with nice appointments! We have been to the Majestic Sun the past three years. 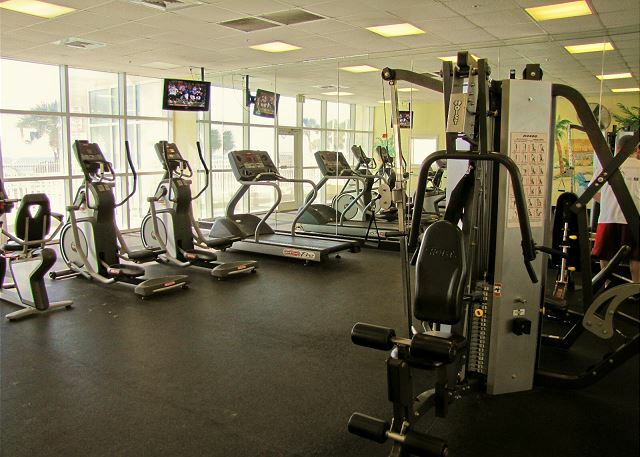 It is a great location and a very nice facility. We have used the Majestic Sun as a family vacation location. So glad you enjoyed your stay at our Majestic Sun B1204 Penthouse condo! It is one of the nicest in the building with the most spectacular views! Perfect modern, upscale beach penthouse. So happy you enjoyed your stay at our Majestic Sun B1204 Penthouse! It is very nice and updated and we do our best to keep it clean, comfortable, and special for everyone! The views are incredible too! Crystal Waters was very easy to deal with. Majestic Sun is a super location on Scenic Gulf Dr. Do not let the fact that it is across the street from the beach bother you at all. It takes less time to cross the street than to walk boardwalks at many other places. 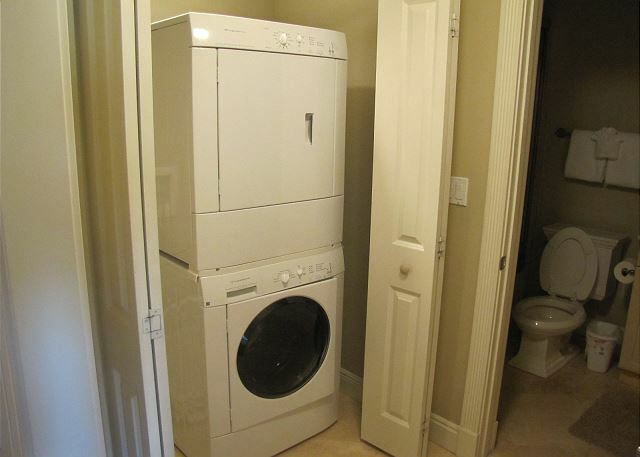 This condo is spacious and comfortable. The 3 bedrooms/baths are private and quiet. Everyone had their own private space. The master bedroom/bath/closet area is huge. The unit was very clean upon arrival too! My only criticism is that some of the furniture is very worn and really needs replacing- including the patio furniture. We would love to stay there again, but would be thrilled to see some new pieces of furniture and some brighter decor. So glad you enjoyed your stay at Majestic Sun B1204! The condo is one of the Penthouse units with more room and an extended, extra wide balcony! The views are incredible! It is closer to the beach than most beach front condos by the time you walk through their grounds. Most people find the decor and furnishings very nice. The leather furniture is fairly new. Will check the balcony furniture and replace it as necessary. Thanks again for coming and for your comments! Gorgeous rental! We loved the huge balcony with a perfect ocean view and even saw dolphins one morning from the balcony! Property is clean and the owners are wonderful and easy to work with. All furniture looks new and main area has leather couches. All of the beds in the four rooms were very comfortable. This unit has a parking space included and additional parking next to the building. There is an indoor / outdoor pool and 2 hot tubs. There are 2 places to rinse sand off and security to ensure that only guests use it. It is a very short walk to the white sand beach. There is a restaurant within walking distance but all other attractions in Destin are only a short drive away. This was our second stay in this unit and we would not consider staying anywhere else in the Destin / Miramar Beach area!! So glad you enjoyed your stay at Majestic Sun B1204! It is an impressive, well kept condo! We do our best to keep it updated, clean, and comfortable for everyone. The views are incredible too!